As part of the countdown to the Week of Hockey Stars in Astana, we at khl.ru are taking a nostalgic look back at the nine previous All-Star Games. Yesterday, we recalled the 2011 event in the Saint Petersburg Ice Palace, so today we reflect on the fourth All-Star Game, played at the Arena Riga in the Latvian capital. Riga was a brave choice by the League for an All-Star Game host city. After Moscow, Minsk and Saint Petersburg, there was an understandable and widespread feeling that the event should move eastwards, to Chelyabinsk or a similar city with a claim to be hockey's heartland, but the case for the Latvian capital was strong, nonetheless. The team, Dinamo, had provided valuable sparkle to the KHL with sensational triumphs in the playoffs, achieving first-round eliminations of SKA Saint Petersburg and CSKA Moscow. There were also commercial considerations. As well as a show, the All-Star Game is a showcase, an advertisement, and Riga could guarantee a modern, packed stadium, a spectacular show and expert merchandising. Riga certainly did a superb job of raising awareness. With the city's mayor, Nils Usakovs, personally supervising the publicity campaign, All-Star Game clocks appeared in various open spaces throughout the Latvian capital, counting down to the big hockey show. For the first time, the event was given its own stylish logo, and the atmosphere was more in keeping with a forthcoming World Cup or Olympics than a celebration of hockey. The hosting of the All-Star Game coincided with the opening in Riga of the first KHL store and first KHL theme bar, with the interior of the latter decked out with hockey sticks, pucks, jerseys of different clubs and even a hockey goal. Among the innovation to the event was the expansion of the festival to more than one day – one of many changes in All-Star Game history which have become part of tradition. And so, on the eve of the big match, the fans were treated to the Legends Game – a contest between teams of Russian and Latvian hockey greats, and few who attended will forget the sight of Oleg Znarok celebrating a goal by moonwalking back across the ice. Following the previous year's match in Petersburg, the League was asked if it would ever change the Yashin-versus-Jagr format. “Of course,” - came the reply. “We can't exepect the pair to play until they are 60!” Jagomir Jagr, still going strong in his mid-40s, seems determined to prove them at least half-wrong, but he returned to North America and Yashin did, indeed, hang up his skates. The search was on for two superstar All-Star captains. Few would argue against the choice of the new captains: at Metallurg Magnitogorsk was three-time Stanley Cup champion Sergei Fedorov, while Dinamo Riga was captained by Sandis Ozolins, a Stanley Cup winner and seven-time NHL All-Star who had even appeared on Latvian postage stamps. As a surprise, the League had included a new event in the Master Show specifically for the legendary pair – the Captains' Duel – a mini-Super-Skills competition, in which Sergei Fedorov emerged victorious. The 2011-12 season had been scarred by tragedy. On the opening day, the 7th of September, a plane, carrying the Lokomotiv players, coaches and staff on their way to their first game of the campaign, crashed shortly after taking off from the airport in Yaroslavl. All the passengers perished. It was decided to hold a silent tribute before the All-Star Game as a mark of respect to the departed and their nearest and dearest. The audience observed the silence impeccably, and held aloft glow-sticks in Lokomotiv red. The moment was given extra poignancy by the venue, as it was here in Riga, at the close of summer, that Brad McCrimmon and the Railwaymen won the Latvian Railways Cup – the team's last ever tournament. Before the All-Star Game in Riga, there was much speculation about the best strategy for winning over the judges in the Most Effective Shootout contest. Should one try a shot from distance, or try to outfox the goalie with some dekes, feints, and body-swerves. When the event got underway, however, it was clear that many players had chosen imaginative costumes, disguises or props - Anatoly Golyshev as Robin Hood, Yegor Milovzorov as a fish, and Andrei Mironov in a supermarket's grocery cart spring to mind. But no-one could have predicted the masterpiece of magic-show trickery from Vladimir Tarasenko. He skated close to the goalie and seemed to have let the puck drift away, but then the puck made a sharp left turn, apparently unaided, back to Tarasenko's stick, and the youngster calmly stroked it into the net past the bemused and wrong-footed goalie. After several million hits on YouTube, it was confirmed the “magic” came courtesy of a fishing line, cunningly threaded through the stick. Tarasenko's touch of trickery has set the benchmark for shootout showmanship. If the Shootout made Tarasenko a trend-setter, then Alexander Ryazantsev in the Hardest Shot raised the bar to a level far beyond anyone's reach. Hardly had the “NHL-versus-KHL” furore died down after last year's winning effort from Denic Kulyash had eclipsed Zdeno Chara's record, when Ryazantsev produced a vicious shot which was timed at 183.67 km/h (114.13 mph, for comparison with Zdeno Chara's 108.8 mph). And it was no fluke: the Traktor defenseman has struck four of the five hardest shots in the eight-year history of the evnt. So far, the Slapshot of the Century. The All-Star Game itself was a 15-11 victory for Team Fedorov and the Eastern Conference, The contest was more even than the final score suggests, and the score was tied until a late blitz by the men from the East, which included a hat-trick from a certain Brandon Bochenski, The losing side showed good grace, as one would expect, but one of them went even further, and instead of singing the praises of the event and the opposition, he decided to sing Opera. 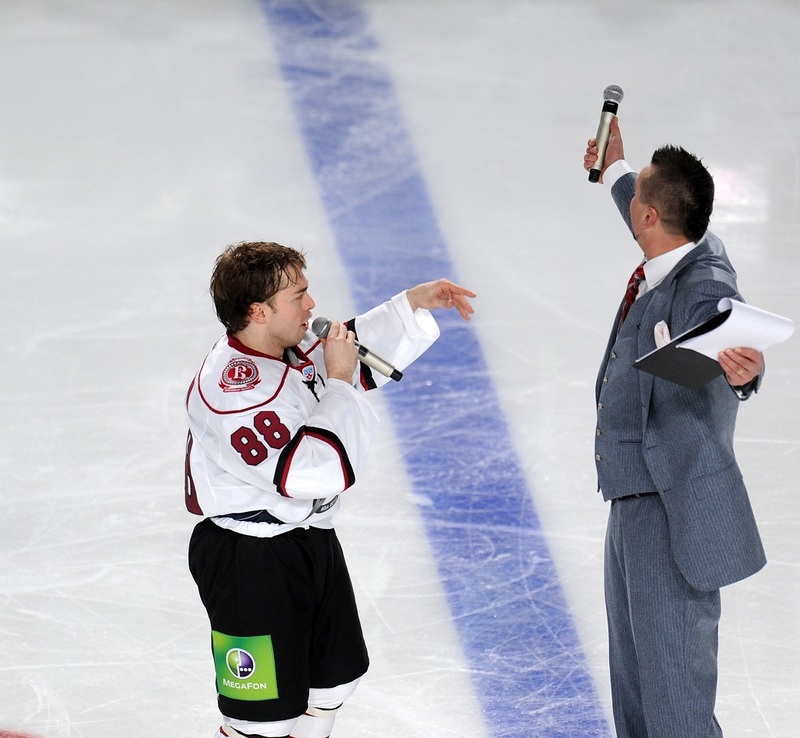 As great as the hockey was, it would be churlish to deny that one of the highlights of the weekend was Mikhail Anisin's turn as tenor, serenading the assembled masses with his beautiful rendition of the Neapolitan classic, "O Sole Mio," yielding spontaneous yet raucous applause. The fourth All-Star Game certainly ended – if readers will forgive the pun – on a high note.